Read the book. Be inspired. Join the movement “From Aid to Trade” as we pursue ambitious, practical solutions to build up innovative businesses—and viable economies—in Haiti and around the globe. Scroll down to learn more about the book and ways you can join this global movement. Click here to join this global movement from aid to trade. Click here as you schedule an event. Why, after receiving billions of dollars, do poor countries remain poor? Why are failing foreign aid models utilized over and over again? After the devastating 2010 Haiti earthquake, authors Daniel Jean-Louis and Jacqueline Klamer observed first-hand the negative consequences of donations provided with the sincerest of good intentions—donations that ultimately undermined local industries and wiped out jobs. Based on primary research and in-depth case studies, and personal experience, From Aid to Trade offers practical, achievable solutions to build up innovative businesses and viable economies in Haiti and around the globe. Ambitious and optimistic, From Aid to Trade confronts the inadequacies of current foreign aid strategies and offers a clear means of economic and personal growth for individuals seeking a positive future for Haiti and other developing countries. HOW DO WE MOVE FROM AID TO TRADE? 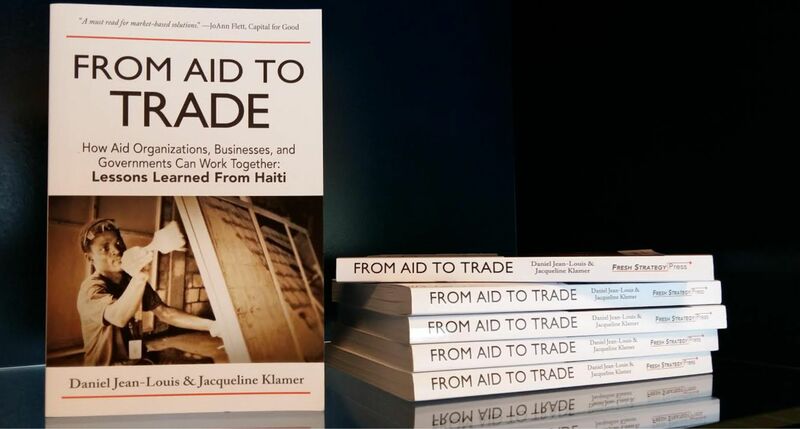 Jean-Louis and Klamer draw from years of working with entrepreneurs and businesspeople to offer a refreshing look at the problem of poverty—one that shifts the focus from aid and assistance to the productive capacity of people. 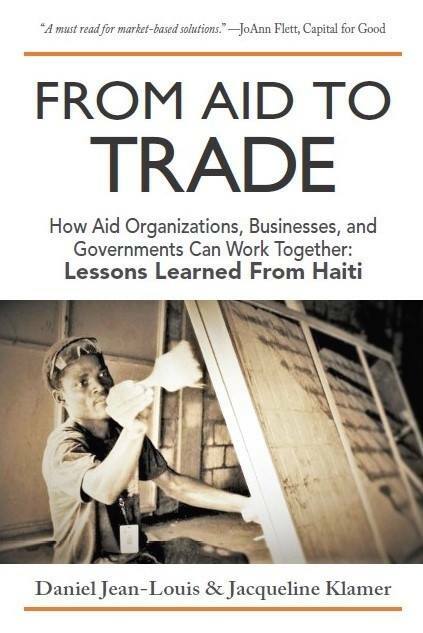 From Aid to Trade is not just about Haiti. It is about creating the conditions for the poor to create prosperity in their own families and communities, and should be read by anyone who is concerned about poverty and economic development. Michael Matheson Miller - Director/Producer, Poverty, Inc. In the context of Haiti, Jean-Louis and Klamer capture the tragic historical events and the rickety development efforts thereafter. Yet, they also prescribe a constructive path forward, where aid organizations and businesses can work together to transform developing nations and their economies. This well-written and most helpful book should be a mandatory reading for NGO leaders, donors and businesspeople who are serious about serving people and building nations. 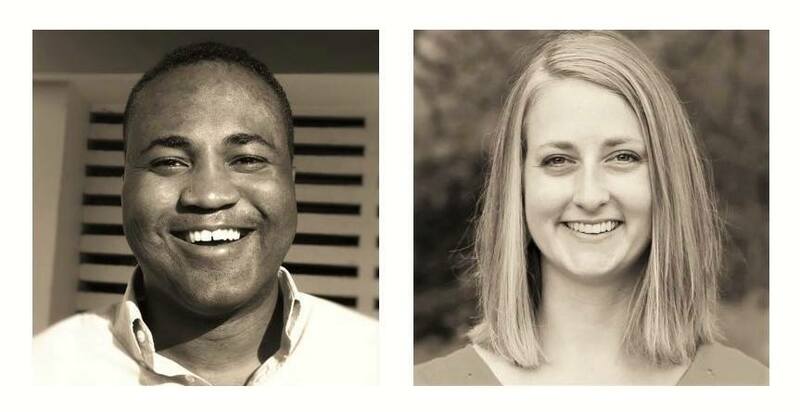 Daniel Jean-Louis and Jacqueline Klamer are right: If you keep doing the same thing over and over, you cannot expect different results. Yet, that is exactly what has been happening in Haiti for decades. This book is a wakeup call. It provides a blueprint for a new Haiti through both in-depth analysis and real life stories and is a must-read for all actors in the Haitian government, the Haitian private sector, and the international community. This book presents a detailed review of the impact of aid to the Haitian economy. Yet, more importantly, it provides a comprehensive response and implementable strategies to transform Haiti from the “Republic of NGOs” to a competitive force in the 21st century global marketplace. Jean-Louis and Klamer offer thoughtful insights as to why Haiti remains a poor nation amidst the ongoing aid, and how changes can be obtained when NGOs collaborate with Haitian businesses. This book is a must-read for those seeking to bring about market-based solutions to economic problems in Haiti and around the world. Daniel Jean-Louis is a visionary whose work inspires many of his generation and generations to come. He is someone with a different approach when it comes to doing business in Haiti, and his insights on business solutions within a developing economy speak volumes. Davidson Toussaint - CEO of Haiti Tourism Inc.
From Aid to Trade offers great insight into the economic woes and opportunities of Haiti’s people—from Haiti, written by a Haitian, for the shalom of Haiti’s people. Daniel Jean-Louis brings expertise, experience and heart to bear on the devastation unthoughtful aid has brought to his country, and the hope that lies in promoting and unleashing the trading capacity of her people. Read and learn! This book embraces the whole paradigm shift Haiti needs to move forward. […] Not only do Daniel and Jacqueline go into an in-depth analysis of the issues, but they also support their arguments with facts. I would recommend this book to anyone who is trying to find the best way to help Haiti. When it comes to Haiti, we all need to change our mental structure. We need to look at Haiti the way we do any other country and see the potential Haiti has to achieve its own unique future. […] Yet, for this change to happen, the government, the private business sector, NGOs, and the international community need to be all in. It will be a long, strenuous battle, yet one we can all win together. From Aid to Trade is a stepping-stone pointing us in the right direction. Ralph Edmond - Cofounder and President of Farmatrix S.A.
Daniel Jean-Louis, entrepreneur and investor, is the founder of Bridge Capital S.A. investment firm and owner of Trinity Lodge in Port-au-Prince, Haiti. He teaches at Université Quisqueya and speaks and trains internationally on entrepreneurship and development. Jacqueline Klamer has worked in business development for nearly a decade with experience throughout the Caribbean, Latin America, Africa and Asia, and is author of articles highlighting Haiti and its opportunities for business solutions.